Most children put the hot, new and expensive toys on the top of their Christmas gift wish lists. How about getting them something priceless this year by teaching them the values of money? The knowledge they will learn from an educational toy is timeless. Even if the money game is left on the shelf, the lessons learned will last a lifetime. Add these educational toys to your list this year for valuable Christmas gifts. Everyone knows and loves this classic money game from Hasbro. If you didn’t get in a few fights with family members over this game growing up, you didn’t really have a childhood. The Banking Edition is a twist on the classic game, with all of the purchases only being made electronically, so there is no colored paper money. Everyone has a bank card instead! This educational toy reflects real life, in that cash is not always readily available. The best part, this Christmas gift will only cost you less than $20! This upgrade to an old-fashioned educational toy is great way to teach your children about money. It is made out of translucent plastic and has not one, but four different chambers to put money in. One is save, one is spend, one is donate, and the fourth is invest. This is a great educational toy to teach your children about each of these money management choices. It comes in four colors and is sold for around $20 and won’t break the bank. What better way to teach your child about money than with a toy cash register? Your child can learn everything from counting to earning to saving money with this educational toy. Some cash registers even have card scanners to add realism. In addition to an electronic cash register, this toy also comes with a grocery basket, play food, utensils, and pots and pans! You can buy a toy cash register for under $30 on Amazon. You can’t really teach your children about money without teaching them about math! This money game uses dice and a cup shaped like a professors head. It also comes with a timer and a note pad. You shake the dice out of the cup, set the timer and write as many equations as you can with the numbers and symbols showing on the dice. Stop when the time is up. For only $16 on Amazon, this game provides educational fun for the whole family! If you buy your child play money as a Christmas gift this year, the possibilities are endless. You can teach them about earning, saving, spending, as well as making change with the (almost) real thing. You can play garage sales, toy exchanges, or even use the cash as compensation for chores. Use your imagination to make up your own money games! There are many affordable options for buying this educational toy. Depending on the age of your child, you can give them the Christmas gift of actual money this year. Instead of just giving them straight cash that they will likely spend on candy, toys, or video games, open up a bank account for them. They even make debit card options for kids that work with an app and allow you to transfer money into the account and limit the stores where it can be used. You will also get alerts when it used and can turn it off with a click of a button. 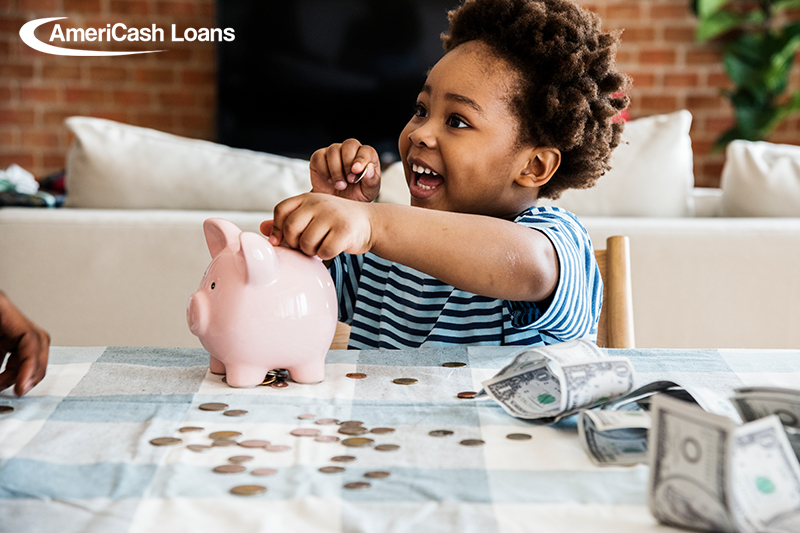 If you have some extra money each month, you can also open a college savings account or an IRA that your child can also contribute to. While not educational toys, these options provide real-life lessons on how to save and manage money at an early age. To splurge on Christmas gifts this year, visit your local AmeriCash Loans. We make getting installment loans of up to $4,000 easy. Apply today! Holiday Engagements: Be a superstar and save!